Love it or hate it, today is all about love. So what better time to talk about the role of books in relationships? When I first met the man who is now Mr. Bookworm, I despised him. No, really. I believe the adjective I used to describe him was "frat-tastic" (which, to be fair, he was), while I prided myself in thinking I was anti-establishment and therefore anti-Greeks. 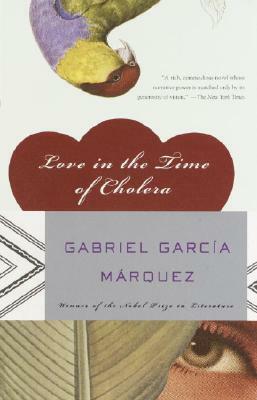 Then he lent me his well-loved copy of Love in the Time of Cholera. I have it on my shelf still (well, I suppose they are our shelves, but I have a hard time relinquishing possession), complete with the scrap of purple cardboard he'd been using as a bookmark when he finished it and passed it my way. Though it is probably an overstatement, I'll refuse to budge on my claim that this book is what turned our uneasy friendship into a relationship. And look, five years later (has it really been that long? ), we're married. Is it too much to contribute our entire relationship to one book? Probably. I'll admit I no longer despised him by the time he lent me the book; I'll also insist that knowing that he'd spent his summer reading Gabriel Garcia Marquez painted an entirely different picture of him in my mind. But even more than that, this book provided a starting point, a launching pad, if you will: we both loved books, and we both loved talking about books. From Love in the Time of Cholera to the Wheel of Time series, we'd found a common ground. One of our very first dates - you know, the all-day kind spent with no true plan in mind - was spent at the Strand, which was a major test for me. I hate to be crowded in a bookstore, followed, hurried, or generally interrupted in anyway. In hindsight, it was probably a stupid place to go on a date. But realistically, I could not spend my life with someone who did not know and appreciate my bookish habits, whether it be the books I read or the way I pass the time in a bookstore. I lucked out: we were (and still are) compatible bookworms. He even took me to see the original manuscript of A Christmas Carol right before he proposed. Outside of classics and science fiction, our reading tastes vary greatly: he reads science books, fantasy novels, and casually flips the pages of Milton on the beach, I read primarily literary fiction with a smattering of memoirs and historical novels here and there. But when our reading does overlap - whether because I've begged him to read something new or by pure chance - we slip right back into the conversation we had that first summer in Washington Square Park. Ok, enough sappy stories about me and my booklovin' husband. What about you? Could you or do you maintain a steady relationship without some common interest? Without a common interest in books? Is there one book that has such strong memories associated with it for you? I met my husband in a bookstore (well, I was working there). He used to order *a lot* of books. I was like: this guy *really loves* books;) It only took him a year (and many, many books) to ask me for a date. My boyfriend is far from a bookworm. He has some books but they're all sports books. He studied journalism in college, and it's not that he doesn't like books but given a choice, reading is not how he'll spend his time. So I wouldn't have said so originally, but apparently I can be with someone who doesn't share my love of books. And as long as he doesn't expect me to become an obsessive sports fan, it doesn't bother me that our hobbies don't really intersect. Lisa - Love it! Sometimes it takes time, but it can be worth the wait. Very oddly my hubby and I do not have that shared love. Most of what I say is "What?! You don't know such and such a book? You've never read blahblahblah? Oh my God, you were so deprived!" It's not that he doesn't like reading, but as far as fiction goes, I think The Hobbit and the LOTR trilogy was the extent of what he read. He's a non-fiction reader, pretty much self-help. SNORE! Breaks my heart. So I decided to remedy this by insisting I read aloud to him. He let me. The first book was Ray Bradbury's Halloween Tree. After that whenever we went to Chapters I would drag him into the kids' section and read him Oliver Jeffers, Guess How Much I Love You (which is now a running "joke" btw us, we always sign to the moon and back on stuff or say it), and so on. I read him a board book called On the Day You Were Born and he insisted we buy it (while trying to hide a tear). That is fabulous - can totally see how books would bring people together. My partner of 6 years hadn't read a book until he met me. His parents are not native english speakers and so reading and education was never something was prioritised in their house. And although he was born herhe (Australia), he learnt english properly when he started school so was already years behind the poeple he was learning with. We bonded over our shared sense of humour more than anything I think, at least initially. This is a truly romantic post. Mr. You Think Too Much is also an academic, and so books are kind of our bread and butter. But he hadn't been reading as much fiction (he's a historian) until we started dating, and now I can persuade him to read something I really like every now and then, most recently, Major Pettigrew's last stand. It helps to both love books, and also, a passiong for NFL football. I'm your newest follower. Steph - That sounds wonderful, too! Mr. Bookworm and I did read the last two HP books to each other, but that was more a factor of only having one copy of each and being forced to share - we read at different speeds, so no shared pages for us. Robyn - Thanks for stopping by! I'm your newest follower as well. Football is a good shared interest as well - lots to do together/talk about there. Darlyn - Thanks! You will, and even if he doesn't, I bet you'll be able to convince him to at least try reading something. After all, that's what us bookworms do - force books on the people we love. It's all in their own interest, of course. Very sweet story... I find it hard to be with someone I don't share some interests with, and though I've dated some people who don't share my love of reading I've found the conversation doesn't last more than a few weeks. To say that my life revolves around books wouldn't be too much exaggeration; and they don't have to be the same books, but I can't be with someone who doesn't understand my love of reading or won't occasionally argue with me over books. I've felt that kind of surprised spark too, when I find out someone likes an author I like - when someone I wasn't even remotely interested in becomes attractive because he likes, say, Charles Portis. My all-time favorite book series (home of one of my all-time favorite books) by one of my favorite authors is The Hitchhiker's Guide to the Galaxy. I picked up the first book in the series at my local library the summer before my freshman year of high school for one reason and one reason only: to get closer to a girl I liked. It worked (sort of) but when I look back all I could tell you about her is her first name and that she introduced me to a series that I have since read, in its entirety, about half a dozen times. And I've read the first three installments at least twice as much. I guess the moral of my story is, if you're going to read a book to impress a girl make sure you don't get into a heated argument about whether or not the fourth installment is worth reading or not. Fail.